Twice as much or twice as long? Because I am a small, aging woman, it falls upon me to do a lot of the heavy lifting when it comes to the chores around the house. (See why here.) Thus it was I found myself power washing the deck on a beautiful afternoon in a last-gasp attempt to refinish it before the snow flies. You get the idea. If you’re lucky, you finish the project in time to host an outdoor party that requires only a light jacket, and not a parka. My companion in this task is a well with a pump that pre-dates the Mad Men era. The pump’s a plucky old gal whose primary attribute (providing free outdoor water) outweighs the fact that she’s a little arthritic, and requires frequent breaks to recharge herself. When you’re lazily watering a garden plot this is no obstacle. The water trickles to a halt, you pull a few weeds, and when it hisses back on you continue. 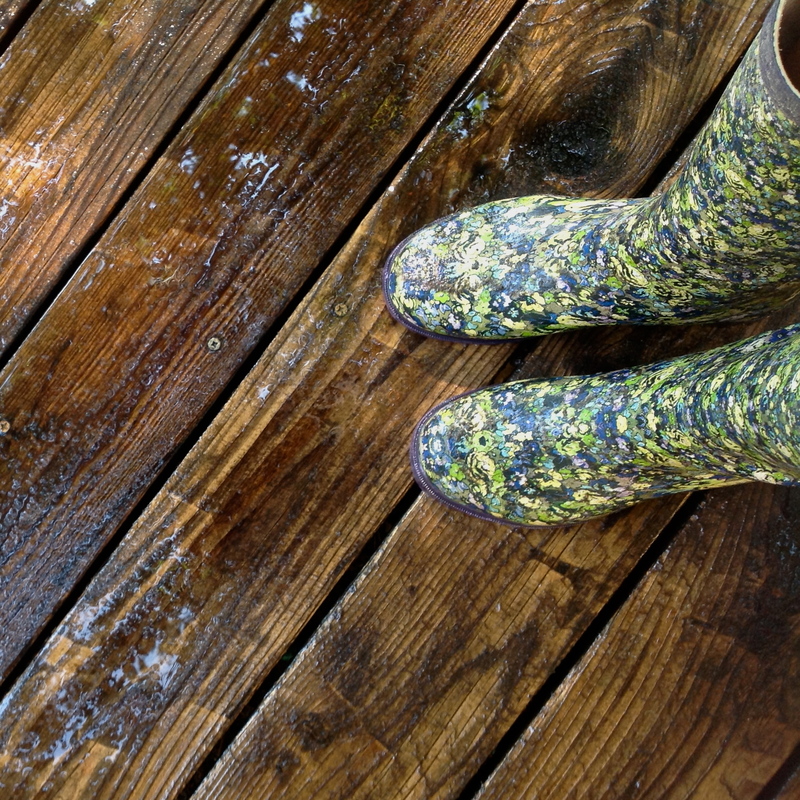 But it’s not so tolerable when you’re washing a large deck whose condition I’ve likened in previous posts to a shipwreck that someone pulled up from the bottom of a freshwater lake and deposited on our lawn, barnacles and all. While some around these parts are fanatical about keeping a clean deck, I’m pretty sure ours hasn’t been washed since our youngest was still eating his Cheerios in front of Elmo’s World (he’s 10). I tried to make the most of the interruptions. I made myself a snack. I had a cup of coffee. I had another cup of coffee. But how much coffee does one really need? I’m not a patient person, and wasting all this time was getting on my nerves. The caffeine was not helpful. So I decided to do what any reasonable person would do when faced with too many chores and too few nice days – weed in between washing. My garden’s a disaster, and the weeds, at this point, were mocking my efforts, so I decided to dispose of a few of the little suckers just to make myself feel better. And so it went. Power wash for 2-3 minutes. Hear water sputter off. Set hose down. Descend deck stairs. Weed for 5 minutes. Hear water sputter back on. Climb deck stairs. Restart washer. Continue ad nauseum. I grew frustrated. And my glutes were getting a little sore. The work was taking twice as long as it should have. But then, again, I was doing two tasks simultaneously. So maybe it was taking half the time. Or maybe I was doing twice as much work in the same time. Or maybe none of this was true. So I gave up the reasonable person’s plan, and instead opted for what an unreasonable person would do. 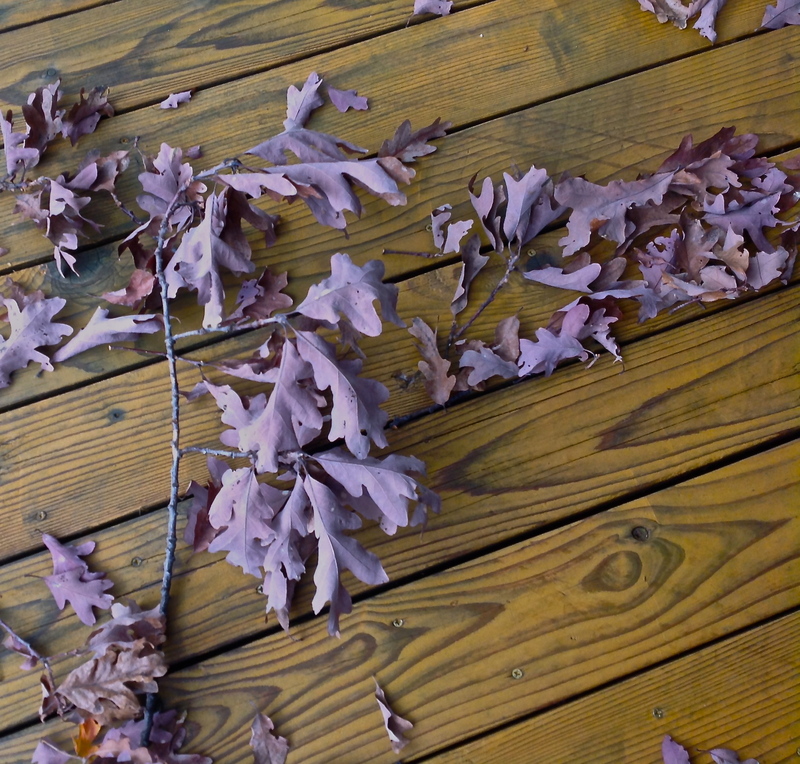 I decided to blog about washing the deck in my downtime. In fits and starts. 2 to 3 minutes at a time. All afternoon. Anything for a little time to write. What an embarrassment. My perennial garden, a source of pride in past years, is a weedy mess. While we were running around during a busy spring, and huddling inside during uncooperative, rainy weather, the weeds moved in and took over. Then, feeling neglected, many of my perennials decided to migrate to different locations, infringe on their neighbors, or waste away to nothing. 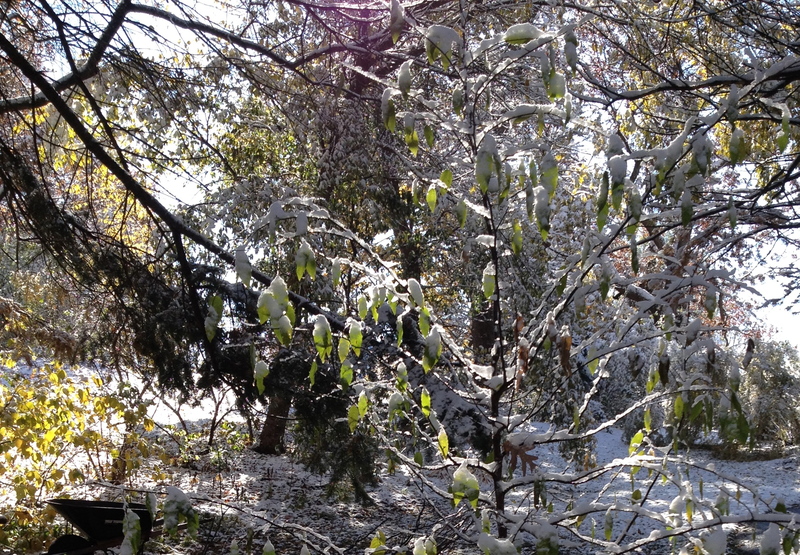 It’s as if Mother Nature’s testing my resolve. Well, I don’t have much, but even I’ve reached my limits. The weekend found me up to my waist in tick-infested, overgrown foliage, yanking out handfuls of invaders. Before I had my kids, the garden was a refuge. I’d head home after a long day at the office, don my grubbies, and dig around in the dirt in the long mid-summer evenings. Pulling weeds felt like an accomplishment. Dividing perennials like a fresh start. I enjoyed the physicality of it. Fast forward a few years, and the garden took a hit. I no longer had the energy or the time to tend it. Ever try to weed with a fussy baby next to you in a playpen, or turn soil with a toddler eating deer poop off the lawn? I have. Pay the neighbor kids to help. My kids are old enough to assist now, but they aren’t willing helpers. I have to bribe, pay, threaten or conscript them. However, my neighbor and I have discovered that our kids, who sometimes balk at doing even work they’re being paid for at home will often jump at a chance to do the exact, same work at someone else’s house. So we trade kids. Pull the tallest weeds first. A method my oldest son caught on to right away because it fills up the bags faster. But it also makes the most immediate visual impact. You’ll actually feel like you got something done. Pull all the similar weeds first. This is a good method to use if you have new weeders who might accidentally remove the expensive day lily you drove miles and miles to obtain. Pull a sample weed. Hand it to them. Say, “Pull out everything that looks exactly like this.” Repeat at necessary intervals. Utilize those garden tools. There is a reason they were developed. If your garden is really awful, like mine, turning over dirt might actually be faster than pulling each, individual weed. Plus, (if you’ll pardon the generalization) those boy children would rather use the tools anyway. Assign tasks based on individual strengths. My oldest son is all about filling up the bags, but my youngest wants to find a tiny plot of soil and make it perfectly smooth and weed free. Assign the perfectionist to the paths and borders where neatness really counts. Otherwise, you’ll just be frustrated that in the time you’ve been clearing the back 40, this child has cleared only one, perfect square foot. Embrace native plants, a method I borrowed from another neighbor. 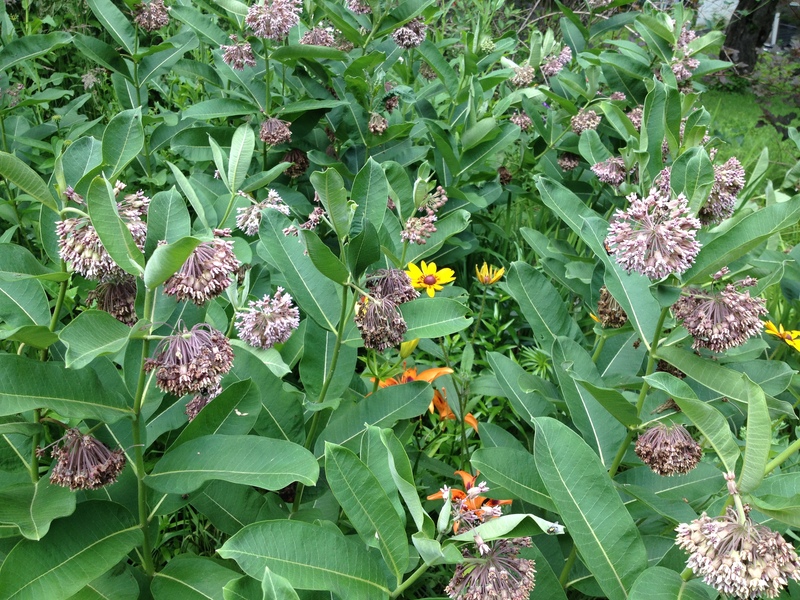 I’ve ceded one whole section of a perennial bed to a large stand of milkweed. The butterflies like it, and it’s pretty enough, especially when it’s in bloom. And I’ve let some other wildflowers take root. 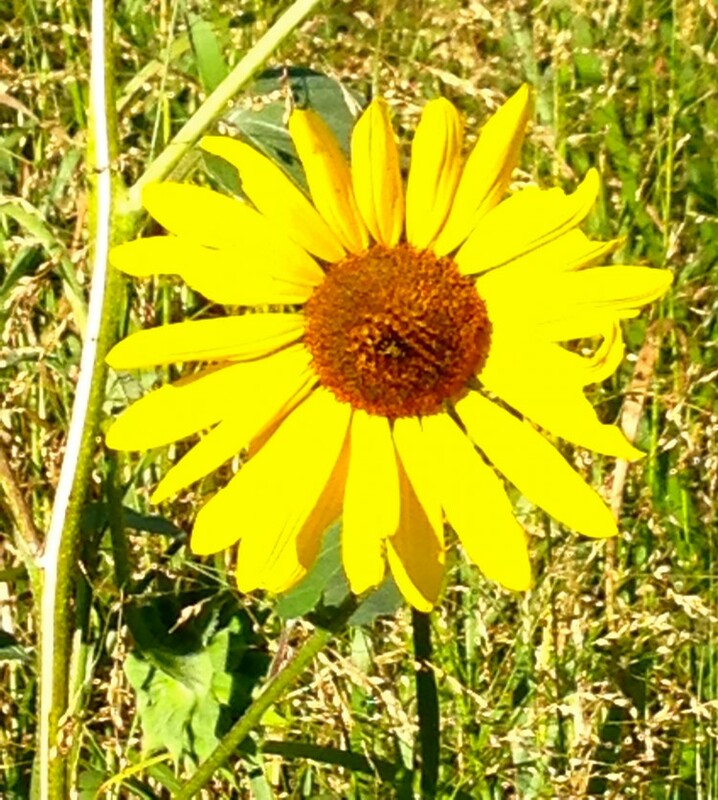 “What’s the difference between a weed and a wildflower?” my youngest asked. “A weed is just a wildflower growing where you don’t want it,” I answered.